Our site has football trading card articles about three of the largest football card producers and a piece on how much an autograph can enhance the value of cards. Look for more article on trading cards as new subjects come to mind. 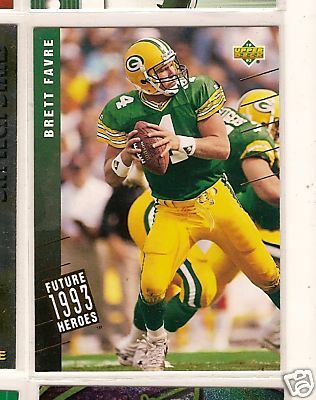 A good example of what I love about trading cards is featured in this 1993 Future Heroes card from Upper Deck. Add a card like this to you collection back in 1993 and you’ll feel like a genius. Here is our list of football cards articles. Upper Deck Football Cards – Upper Deck puts out the most football cards of any major card distributor, with many new card series every year for both incoming NFL rookies as well as many football greats. Donruss Football Cards – Donruss is one of the largest producers of football cards and is considered one of the Big Three of the business. Donruss also happens to own Topps. Topps Football Cards - Topps has sold football cards since 1955, though it was in the trading cards business as far back as the 1930′s. Topps continues to produce new sets of NFL cards every year. Score Football Cards – Score doesn’t have as many card series every year as Upper Deck or Topps, but this Donruss-owned company still produces cards that are highly valued by collectors. Autographed Football Cards – An article on how much value an autograph adds to a football trading card, including a list of current values on star trading cards. Football Cards Terms – A glossary of football card terms, general sports card terms and even sports memorabilia terms.